There are many motels and hotels in Palm Springs Centered within a few blocks of downtown. We find that these locations are by far the best. 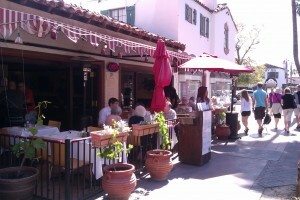 You can walk to most restaurants, bars and activities held in the Palm Springs area. Some hotels are located at casinos and golf courses. These properties are very nice. If you’re a golfing enthusiast then you probably want to be near the golf course. However you must get in your car and drive anytime you want to go anywhere. Drinking and driving issues comes to mind in a situation like this. Check your location first based on what you like to do most. Book hotel or motel within walking distance or near a resort or by a golf course that you can go golf at. There is a Hard rock hotel in downtown Palm Springs , which is one of three hotels in the downtown area of Palm Springs. There are also a number of luxury motels in the area which are very comfortable, have pools, and parking and are very convenient to downtown. At events that are held in the Palm Springs area, parking is usually at a premium. On Thursday night for example they have the Palm Springs Street fair which brings thousands of people into the downtown area. If you’re staying at a motel or hotel close by and can walk this is a major convenience compared to driving and then trying to find a place to park. Book your hotel, or motel early so that you can find a place that you prefer. During January February and March there is a major snow bird surge in the population. Rooms are always at a premium and everyone is trying to find a place that meets their needs.